Given how busy our schedules have gotten, Tobie and I don't quite have as much time to catch new movies at the cinema. But we really push for things from time to time or when opportunities come up. So despite big budget movies like Exodus and such being out, I was most happy to devote a surprise movie slot to watch the new Penguins of Madagascar movie. For fans of the Madagascar series of animated movies, the lead characters in Penguins of Madagascar shouldn't be all that new. The four quirky penguins were a major source of comic relief in the original movies and more often than not ended up stealing quite a number of scenes. And after exploring all these characters further through various TV spin-offs, we finally get a movie focused on the penguins alone. I'm pretty sure that I've admitted that I'm rather into penguins for one reason or another. And I'm not talking solely about these penguins from the Madagascar movies - I think back to how much I laughed the first time I watched the Wallace and Gromit short, "The Wrong Trousers." How can you not laugh at a penguin who dresses up as a chicken with a rubber glove in order to commit crimes? But I digress. 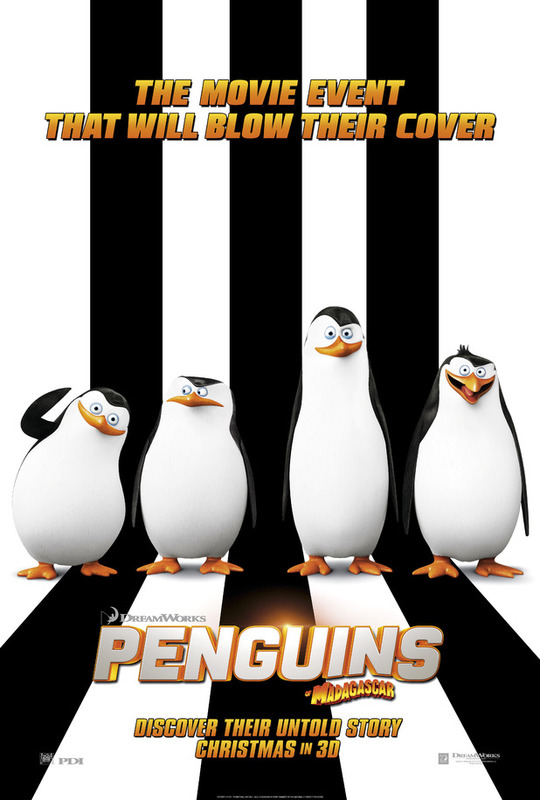 Synopsis: Penguins of Madagascar is an animated comedy spin-off movie directed by Eric Darnell and Simon J. Smith with a screenplay by Michael Colton, John Aboud, and Brandon Sawyer. For those keeping track, it takes place after the events of Madagascar 3: Europe's Most Wanted but is not directly tied to the animated TV series, The Penguins of Madagascar because reasons. The movie starts at the very beginning - all the way back in Antarctica with three very young penguins, Skipper (Tom McGrath), Kowalski (Chris Miller), and Rico (Conrad Vernon). We see that they're not your typical penguins just willing to follow the others in one long line and are pretty ready to defy the status quo. True enough, they end up staging a mad rescue for a wayward penguin egg that everyone opted to ignore. Thus we meet Private (Christopher Knights), the newest member of their group, now a quartet. And thus they float off into the future together. Back in the modern period, we find the penguins staging another daring heist - this time to break into Fort Knox. But they don't care about the gold - their true objective is to gain access to one of the last Cheese Dibbles chips vending machines in celebration of Private's birthday. It also provides a weird break-down of the roles of the different penguins - Skipper is the leader, Kowalski is the brains and Rico is the arsenal specialist. Private just tends to be cute and is treated like the team mascot - however he obviously wants to be more than that. But before we can explore this further, the penguins are kidnapped by the vending machine and taken away to Venice, Italy. The movie is a fast-paced comedy spy piece with exciting chase sequences, crazy dialog, and never-ending sight gags. It sounds like a crazy combination of elements (and I'll give you that much, it is crazy), but on the whole it makes for quite the hilarious movie experience. And after a very long day at work, this movie is perfect for laughing away your stress and all that icky work stuff. The movie is obviously meant more for kids in terms of design. It has a fairly straightforward "mystery" at the heart of things and we get to meet the movie's villain right at the very beginning of things. Dave (surprisingly John Malvokich) is determined to seek his revenge against penguins all over the world for being cute and cuddly, thus stealing the spotlight from an ugly octopus like him. And since our four heroes represent the very first penguins who got him moved to another zoo, they become the focus of his ire. The dialog of the movie is downright hilarious whether tied to sight gags (like Skipper noisily eating chips while other characters are talking) or Dave barking out orders that double as celebrity name puns (e.g. "Nicolas, cage them!" or "Drew, Barry, more!". And I'm a sucker for puns and other forms of lowbrow humor, as juvenile as it all sounds. But the sight gags are totally on point as well ranging from the hilarious black and white stripe infiltration scene popularized by the trailer and all the weird plans that the penguins cook up, it all gets really crazy really fast. Maybe I was just in the prefect state to watch this movie since I had literally just gotten off a crazy series of work shifts, but the penguins always made me laugh before and dedicating an entire movie to them was comedy gold for me. Admittedly, the penguin humor may not be for everyone. If you didn't quite appreciate them when they appeared in the Madagascar movies, then you won't have the patience for a whole movie about them. If you don't like non sequitur action that shifts wildly about in a movie, then again this movie may not work for you. But if you enjoy such leaps of logic with only puns and sight gags to connect one sequence to another, then plunge right in - the water is perfect. Penguins of Madagascar is a light, crazily fun movie that makes great use of these characters and the team of talent gathered for the movie. I was laughing all throughout but I know movie will feel a little shallow to some. But despite that, I'll still give it 5 bizarre penguin plans out of a possible 5.